Enter Harbour Valletta. 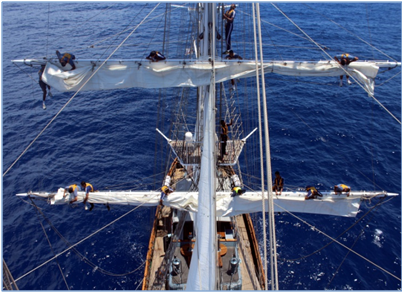 As always the preparation for entering a harbour for a sail ship like ours starts a day in advance, especially when the two days alongside are packed with activities. 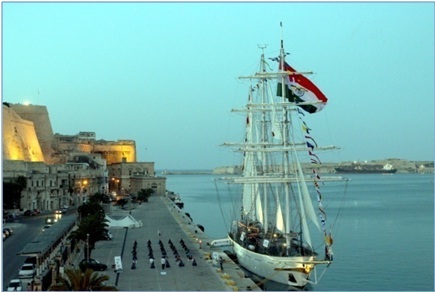 The ship entered Valletta Harbour and was berthed on Pinto Wharves 4/5 as first ship. 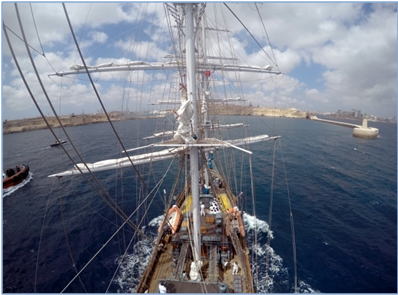 Reception Onboard. 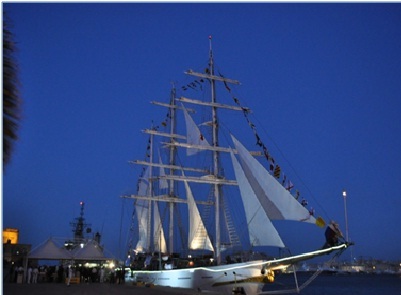 A cocktail reception was hosted at the wharf at 1900 hrs with the ship in the backdrop. The ship was dressed overall and illuminated with fore and aft sails set for the occasion. 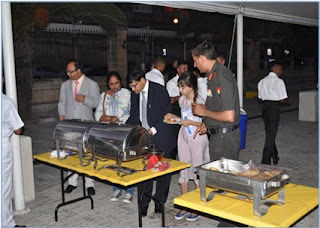 The function was attended by Foreign Affairs Minister of Malta, Indian High Commissioner to Libya and Malta, Embassy staff, Defence Attaches of various countries, Port Officials and other dignitaries. 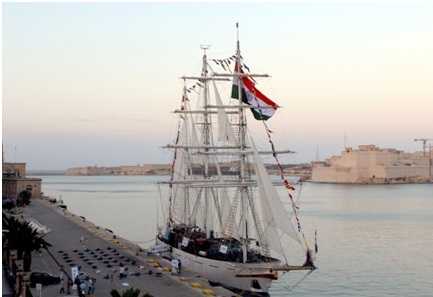 The Commanding Officer addressed the gathering and thanked the Maltese Government and the Navy for hosting the ship and the guests for attending. After this he gave a small brief on the ship and this voyage, this was accompanied by slide show depicting various activities. At “Five Minutes to Sunset” attention was drawn to the significance and history of the Sunset Ceremony. 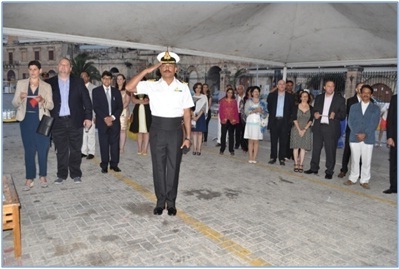 The gathering was suitably placed on the Jetty for them to watch, as the Officer Of the Day took charge and conducted the Ceremony while the ship’s Bugler played the ‘Last Post’. Indian snacks served during the cocktail were highly appreciated by one and all. 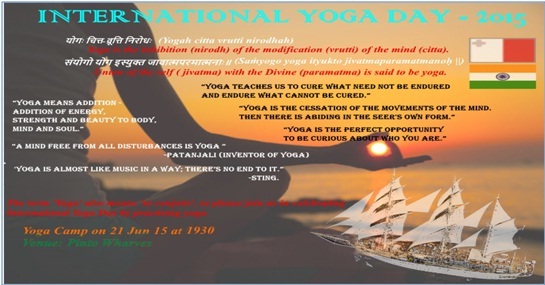 During the reception, in conjunction with International Yoga Day Celebrations on 21 Jun 15, pamphlets indicating the events for the celebrations and importance of Yoga in daily life were distributed to all the guests. 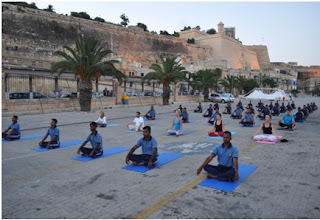 All the guests were extremely happy with warm reception and were enthusiastic for taking part in International Yoga Day celebrations next day. International Yoga Day. 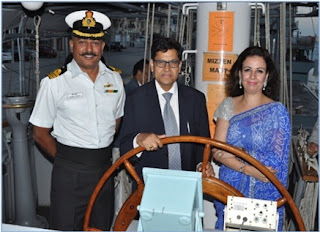 As part of International Yoga Day celebrations, the ship made concerted efforts to spread awareness about Yoga and to popularise the events being hosted by the ship on 21 Jun 15. Towards this a decorative pamphlet and Banner were designed by Lt Nandeesh Jolad of the ship, and the pamphlets were distributed among the local populace. Yoga Workshop. The first event for the day was a Yoga Workshop organised in the premises of the Indian Embassy, Libya and Malta at 0800hrs on 21 Jun 15. The event was attended by Officers, sailors and Sea Trainees from the ship. The workshop covered topics related to Evolution of Yoga, Yoga and India, practical demonstration of all basic ‘Yoga Asanas’, Importance of Yoga in daily life, and benefits of Yoga. Yoga Camp. 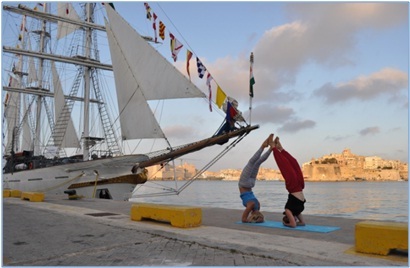 A Yoga Camp was conducted by ship’s staff for the local populace at Pinto wharves 4/5 at 2000 hrs on 21 Jun 15, where the ship was berthed. 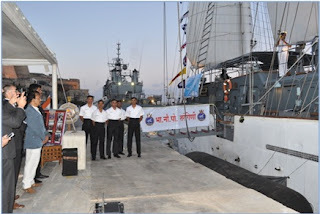 The ship was dressed overall and was used as backdrop for the event. The camp was attended by Indian High Commissioner to Libya and Malta, Defence Attaches and Embassy staff. 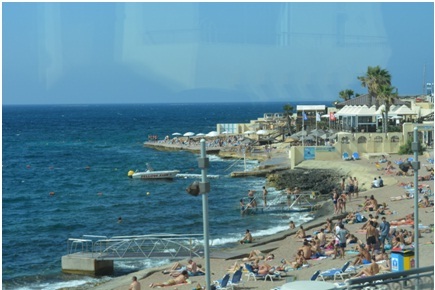 A live telecast of the same was broadcast on Maltese National channel. The event gained much popularity among the local populace. Visit to Valletta. A guided tour of Valletta city was organised for the Sea Trainees commencing from 1400 hrs to 1800 hrs on 21 Jun 15. 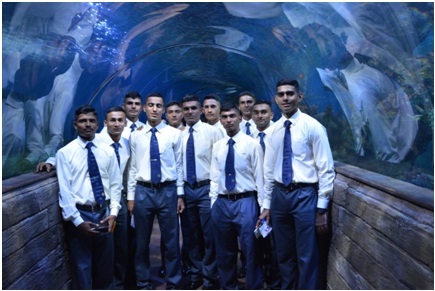 The tour comprised of visit to places of historical importance, general interests, shopping avenues and local market. Valletta war museum gave a great insight of the struggle of the people of Malta over the years of conflict and during the world wars. 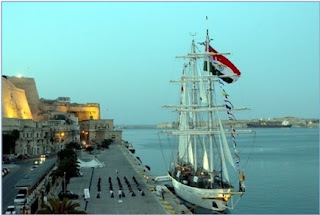 It serves as an icon for the bravery and heroism of the “Knights of Malta”. 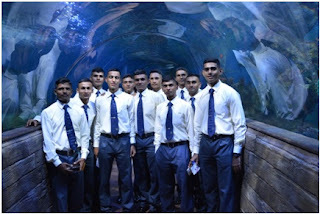 Tour of the beautiful Malta National Aquarium was a treat indeed. It was a very well maintained depiction of marine life around the Islands. 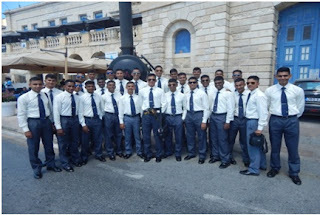 The personnel also visited the city square and the Upper Barakha gardens which provide an eagle view of the entire city.